Run a Pocket-Sized Farm and Sell Your Produce to Other Players! Gorgeous environments populated by cute-looking animals. Includes a nice variety of options to run the farm your way. Trading goods with other players adds a new spin on things. Features quicker and more efficient touchscreen controls than usual. Do you hear that? The rooster’s crowing. It’s time to get up, greet the morning, and get to work on the old farm. It may not be the most glamorous job out there, but even the most cosmopolitan and technologically-advanced cities would be in a lot of trouble if they didn’t have at least one farm to back them up. In Hay Day, you will take control of one such farm. Everything about it is yours to control! You will decide on the look, you will determine the layout of the fields and facilities, and you will ultimately choose what goods you want to produce. Will you plant fields of corn that stretch as far as the eye can see? Will you raise entire herds of free-range cows? Will you make money by simply selling your produce or will you convert it into more valuable goods? The call is entirely yours and the power to choose is literally at your fingertips with Hay Day! The world of Hay Day is a truly remarkable little place, with colorful visuals and charming characters. By building a farm, you can leave your own mark on it. Get your creative juices flowing; no two Hay Day farms will ever be alike. Till fields, set up buildings, clear out trees, and determine the overall layout for your farm with a few strokes of your finger. Give your farm its own unique name. Collect valuable gems to speed up the construction process of fields, buildings and facilities. No farm is complete without a few fields worth of crops to raise. Just about every delicious dish that we know of begins life as a few humble little seeds, so treat your plants as if they were your own children. Take good care of them and they’ll take good care of you down the line. Grow dozens of crops, including wheat, corn, sugarcane, strawberries, potatoes, cacao beans and more! Harvesting is easy. Just run your finger over your plants after they’ve ripened and they’ll be ready for storage or the market in seconds. Build silos to store your harvest. Be on the lookout for special items while you harvest. You might come across useful materials as you work, including screws, saws and even deeds for land. Animals play a big role in farm life and Hay Day is no different in this regard. Just like in real life, animals provide foodstuffs and resources you can’t otherwise find growing in the dirt. They also add a lot more personality to your little virtual patch of paradise. Raise all sorts of animals, including cows, pigs, sheep, chickens and goats. Provide them with a regular supply of food and water to keep them healthy and happy. Collect valuable goods from your livestock, like milk, eggs and wool. Purchase some non-producing animals like cats, horses and dogs. Earn extra experience from them as you watch them add even more life to your farm. You have your wheat and you have your milk. Do you think you’re good to go to market yet? Slow down; you can do a whole lot more with your harvest. Harvested and collected goods can be used to produce even bigger and more complicated goods. You can make a lot of money producing and selling this stuff, provided you’re also willing to get the right equipment. Refine existing materials into products. Turn your wheat into bread, make butter and cheese from your milk, convert sugarcane into white and brown sugar, and so on. By combining existing goods and products, you can produce even more profitable stuff, like pizza, blackberry muffins, buttered popcorn, pancakes and more. Buy specialized machines to “cook” your ingredients and make the products. Get a cake oven, barbeque grill, coffee kiosk and candy machine. This is it. This is what all your hard work in Hay Day has been leading up to. Your farm’s produce is in high demand and there’s a lot of profit to be made, provided you have some good business sense. Meet your customers’ demands. Fulfill orders to the farm that come in regularly. Sell goods off to your neighbors for quick cash. Features a player-run economy. Analyze the market online and sell your goods to other players for whatever price you deem worthy. Buy extra supplies from other players if you really need them. When it comes to portable farming simulators, you can’t go wrong with Hay Day. It has a great abundance of goods to harvest, collect and produce. It lets you buy and sell directly from other players, which is something you aren’t likely to find in many other sims. Most of all, it’s brimming with a lot of charm, color and personality that will bring the touch-screen of your mobile device to life like no other! With Hay Day, every day will feel like pay day! Hay Day is very likely the very last thing everyone in the world of mobile gaming was asking for: yet another farming sim. There are countless editions of this kind of game available for casual, mobile and social gamers alike, and just about all of them are hard to differentiate from one another. If you have played one, then you have likely played them all. That aside, it would be unwise and unfair to dismiss Hay Day just like that. While it is indeed derivative, it still manages to at least be a polished entry that plays very solidly. It’s also hard to deny that it is indeed very charming to look at and has a bit more personality than the usual farming simulator. To its credit, it also manages to add some more social elements that make a lot more sense for what running the business side of a farm is all about. If you’re still intrigued, then read on to see how well it all works. In terms of graphics, Hay Day is very nice. Everything has a very colorful and charming cartoonish aesthetic that looks sharp even on a small screen. Buildings and machines look distinct, icons are detailed and well-drawn, the interface is intuitive without getting in the way, and people add life to the scene just by traveling around. There’s little to complain about the visuals of Hay Day. Special care was especially paid to the animals, who definitely steal the show. While the livestock in most of these games are content to just mill around and graze, Hay Day injects them with a lot more personality and anthropomorphism. Chickens dance happily together in a row, while pigs sit down in the mud as if they’re just chilling. Furthermore, you can gauge your animals’ needs by looking at their animations. Instead of using icons to inform you of their hunger levels, animals may do something like point at their open mouths to indicate when they need food. The farm of Hay Day looks far more interesting than the likes of FarmVille by leaps and bounds. You’ll want to populate yours with as many animals as possible just to see them in action. 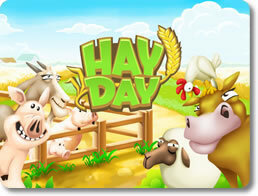 If you’ve played FarmVille or its many knockoffs, then Hay Day should be immediately familiar to you. At its base, you run the day to day operations of the farm. You plant crops, feed your livestock, construct buildings and facilities, spruce the place up, make sophisticated goods from your produce, and complete quests for a myriad of NPCs. Everything is done with a few simple finger taps or swipes on your screen. It’s pretty basic stuff overall. It may have a lot of mechanics, but like all the other mobile farming sims out there, the beginning will walk you through the processes step by step. You’ll learn how to set up your buildings, put down plots of land for growing crops, make roads, and all that other fun stuff. However, Hay Day immediately shows a bit of improvement over the competition with far better touchscreen controls. In most of these games, you pretty much have to tap every individual thing to get anything done. In Hay Day, all you need to do is run your finger around the screen and touch every interactive object in the process. In an instant, you can harvest every crop, sow every seed, or feed every animal on your screen. It’s a very welcome change. Sadly, Hay Day does not exactly make changes where a lot of people would probably like them to. At the end of the day, this is still a free-to-play game. While you can certainly download and play it all you like without having to pay a cent, you’re going to do a bit of waiting if you do. While the early crops, goods and buildings can be set up relatively quickly, the later and more exotic stuff still boast some long times to incubate. Keeping the pace going means you may eventually have to buckle down and start buying the otherwise rare gems in bulk. To be fair, Hay Day isn’t the most obnoxious title when it comes to this; there are plenty of worse ones out there. It could still be better. These kinds of games usually carry a social element. 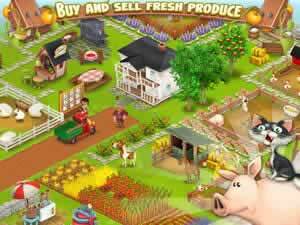 Hay Day differs from them in that it has a much more immersive and interactive one from the usual stock. 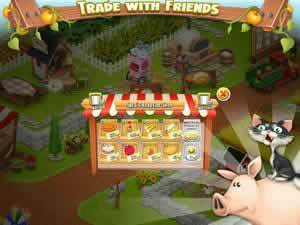 The game does encourage you to link up with your friends on Facebook, and lets you take a peek at their farms. However, it also encourages you to trade the fruits of your farm’s labors with your fellow players. Using the in-game newspaper, you can post ads where you can offer to sell your goods for a price point of your own choosing. In turn, you can also buy other players’ goods. It’s such a small thing, but it adds so much to the package. There’s a whole little economy run by the player base to find here as people try to one-up each other with their collections of farm-fresh goodies. Besides that, it also means that there’s a good range of ways to specialize your farm’s operation. While a lot of these mobile tycoon games offer a good deal of options to run your business on the surface, the truth is that you pretty much have to do everything if you want to get anywhere. In Hay Day, you can devote your resources to simply fill in a little demand for a few specific products, sell them off to other players, and then use the cash to make your farm even better at what it does. You’re free to complete every quest and achievement in the game if you want, but Hay Day gives you ample opportunity to actually run your farm like a business. Hay Day may not be the most original game around, but it’s safe to say that it could be described as one of the best. The visuals are solid, the animals are cute, and the interactivity is leagues ahead of the rest. More than anything else, the player-run commerce options add a bit of depth to the old formula that helps to revamp it in many ways. If you didn’t like all the other farm sims out there, Hay Day will do little to change your mind. If you have enjoyed them, then Hay Day’s mechanics represent the next logical step in the genre.